For those without comedic tastes, the so-called experts at Wikipedia think they have an article about Adventure Time. Adventure Time (originally titled Adventure Time with Finn & Jake) is a messed up, American cartoon series created by Pendleton Ward that airs on Cartoon Network at exactly 9:00 eastern time on Sundays. It follows the adventures of Finn, a 14-year-old human boy, and his pet dog Jake, on their unnecessary yet entertaining adventures in the land of Ooo, and in some cases the underworld. The show teaches its young viewers many important lessons, which include how valuable friendship is, how the best solution to anything is to whack it with a sword, and how to develop an effective hammerspace cavity. 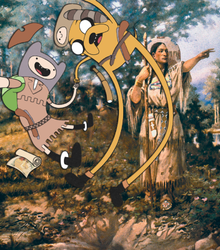 Pendleton Ward claims to have conceptualized Adventure Time when he was tripping very badly. Falling flat on his face knocked into his head the composite image of our two protagonists, Finn and Jake (and fractured cartilage in between the two of them, which was soon to become Marceline) scaling an icy mountain. Having no better sense of judgement, he took his vision to the studio and discussed them with his fellow neo-hippies, and thus was born through much LSD and paintball matches the show of which we know today. As of today, the show continues airing within its to-be short lifespan. How do you even... do that?!? 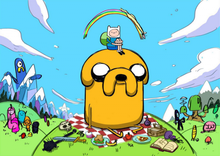 Finn is the main character of the series, and the most notorious example of an adventurer in the land of Ooo, though he was indeed to short to join the Hero's Guild. Due to his ability to conceal a sword in hammerspace, wiggle his arms with utmost defiance towards the laws of anatomy, and emit disturbingly high-pitched screams, many villains have spawned out of envy. However, he has managed to defeat them all within the course of a single episode, aside from the Ice King, who he really just feels sorry for. Jake Roberts is Finn's pet/partner in counter-crime, and the other main character of the series. He appears as a yellow-furred dog with inverse-colored moons for eyes (most dogs with eyes like that are usually blind) and wrinkled, drooping jowls, which is supposedly one of the many side-effects of his stretchy powers. Marceline is Adventure Time's main villain, bot does not play out like one. She is an immigrant from the underworld, deeming the vampire men there to be too sparkly and wonted. She hooked her skinny, healthily used canines up with Finn promptly after her arrival. This has started sexual competition between her and Princess Bubblegum, eventually giving way to a quite literal war between the two. The war was won, but not by any particular side. The Ice King is the ruler of Iceland, known to many as "Ice King's Folly" or "Ice King's Icebox" because he's the only person populating it, if you don't count the hundreds of cute penguins. Like many other villains, the Ice King receives great pleasure out of kidnapping people and shooting stuff out of his fingers at humanoid sheep. All his power comes from a fancy crown on his head, and he's revealed to have been driven insane by, and also protected by it, for 1000 years, give or take. To cut a long story straight, he is one messed up dude. DO NOT SPEND MORE THAN TEN MINUTES IN HIS COMPANY UNLESS YOU WANT TO FEEL REALLY DEPRESSED! SERIOUSLY! PRETTY MUCH, LIKE, ALL THE MAIN CHARACTERS HAD TO LEARN THIS THE HARD WAY! Just when you thought Ice King will win the most-messed-up competition, this guy comes along. He's a mean, lean, screaming machine. His shrieks are enough to drive the weak willed insane, so, let's get some of that action, shall we? NOT SAFE FOR WOMEN!! The article you are looking at may not be women-safe! If a girl or your wife sees this article, claim that it was spam and blame the IT guys. Otherwise, continue to read it until your lewd urges are satisfied.